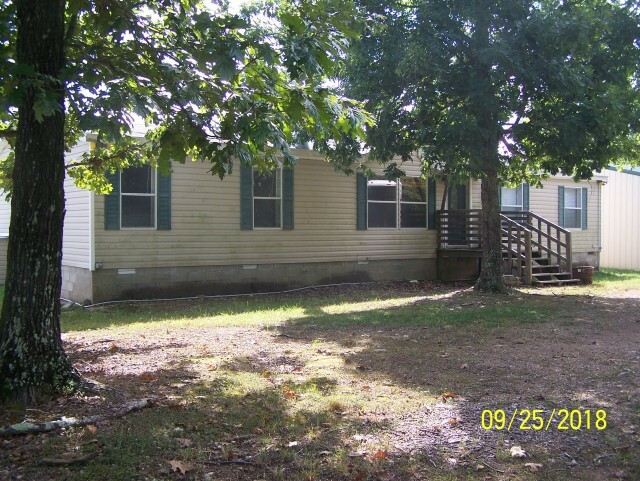 Located on a dirt road this newer double wide manufactured home sits on 16.65 acres. There is a storage unit, storm shelter, detached garage, and land is mostly wooded. Home has 4 bedrooms, French doors at dining area, spacious rooms, and fireplace. Owner has started some renovations, but due to health unable to complete. This is your chance to complete and make it like you like it. Second bathroom in midsy of renovations. Some walls need to be painted, some flooring needs to be laid, etc. You need to look at it to determine if it is something you would like to do. There is a large container storage unit, a storm cellar, garage has a dirt floor, and most of the land is wooded. Quiet and peasefull location.